Kya aako bhi wordpress ke bare me 0% knowledge hai like website kaise banaye, hosting kaise le, setup kaise kare etc etc. Bina kisi knowledge ke sirf click-click se apni wordpress site create karna chahte hain? To bus ready ho jaiye, sirf 10-15 minutes me apni well- designed beautiful wordpress site create karne ke liye. Kya isme paisa (money) spend karna hoga? — bina money ke kuch hota hai kya? Yaha bhi aapko paisa spend karna hoga. Ek professional website create karne ke liye aapko money spend to karna padta hai. To chaliye learn karte hai kaise aap easily, bina kisi technical assistant ke automatic sirf clicks se wordpress site kaise launch kar sakte hain? ThemeCloud Hosting —ek premium Hosting providers hain jaha aap wordpress hosting purchase karke apni site launch kar sakte hain. 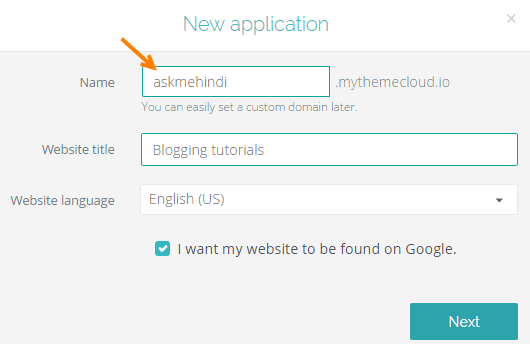 Themecloud ki sabse khaas baat yah hai ki yaha aap single click me site launch kar sakte hain. Koi bhi new wordpress user jisko kisi cheez ki knowledge nahi hai wo bhi yaha apni wordpress site bana sakte hai. Themecloud aapko 15-days trail provide karti hai jisme aap free account create karke test kar sakte hain, how it work. Ok, to chaliye themecloud par wordpress site create karke dekhte hain. Sabse pahle Themecloud par visit kare aur apna free account create kare. Apna Email address confirm kare, and account me login kare. Account me login karne ke baad Dashboard par “New Website” par click kare. 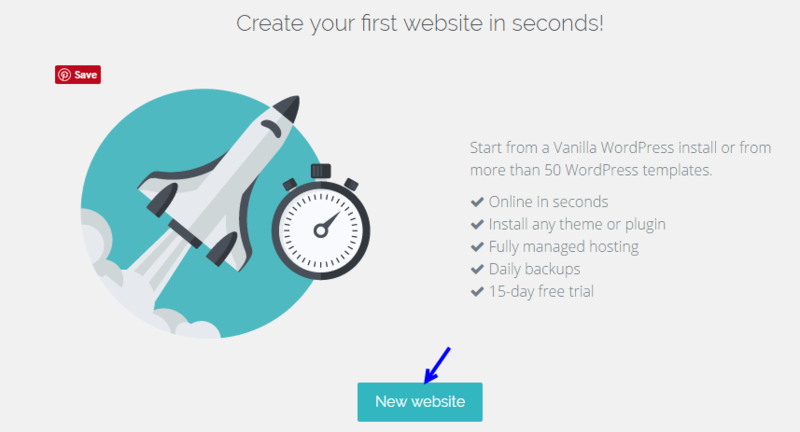 New website par click karne ke baad popup window me aapko 2 options provide kiye jayenge – Vanilla WordPress install and Pre-built WordPress website. Yaha aapko Pre-built WordPress website select karna hai. Get started par click kare. Next screen me aapko Themecloud inbuilt theme select karna hai, aap yaha apne site niche ke according alag-alag category ki themes select kar sakte hain. Themecloud theme collection me well coded premium quality ki theme available hain, mean aapko theme buy karna aur install karna nahi padega. 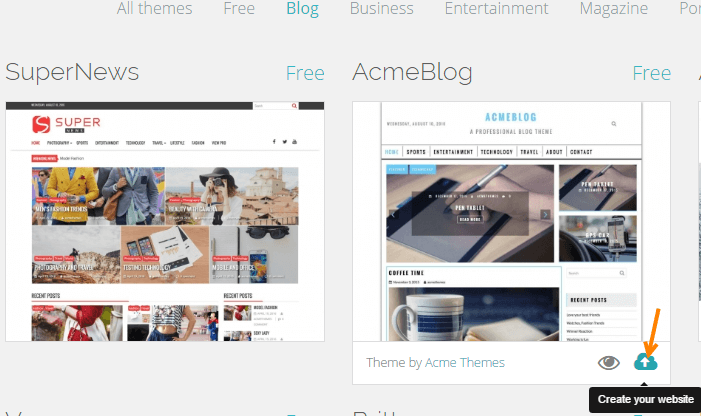 Main yaha Blog site create karne ja raha hu isliye Blog category ki theme choose karunga. Aap theme ka preview bhi dekh sakte hain. Theme select karne ke liye theme ke below create your website icon par click kare. Theme select karne ke baad popup screen me apne site ka temporary address enter kare, aap baad me apna custom domain set kar sakte hain. Name, website title enter karke Next par click kare. Next par click karte hi aapki website creation process start ho jayegi and kuch seconds me aapki site create ho jayegi. Website create hone ke baad aap dashboard par apni site ka control panel dekh sakte hain, jisme backup, settings, hosting plan ki settings dekh sakte hain. Yaha aap Go to my website par click karke apni site ka live preview dekh sakte hain. Ab hume apna custom domain add karna hai. Website control panel par settings par click kare, now click Configure Domain. Configure Domain par click karne ke baad popup box me apna domain address enter kare. Domain name submit karne ke baad screen me A record and CNAME record show karenge jo aapko apne Domain name settings me add karna hai. A record and CNAME record details domain me add karne ke liye apne Domain name provider account me login kare aur details add kare. A name and CNAME record add karne ke baad kuch hours ka wait kare, aur uske baad Refresh par click kare. That’s it aapne custom domain add kar liya hai. WordPress dashboard par login karne ke liye aapko kuch special nahi karna hai, theme cloud account se aap apne dashboard par login kar sakte hain. Go to website par click kare aur website ke top navigation panel par dashboard option par click kare. Dashboard par login karne ke baad aap apni site se related other necessary settings kar sakte hain. Jaroori settings karne ke baad aap necessary wordpress plugins install kar sakte hain. Aap apni custom theme bhi install kar sakte hain, jaroori nahi ki aap themecloud theme use kare. 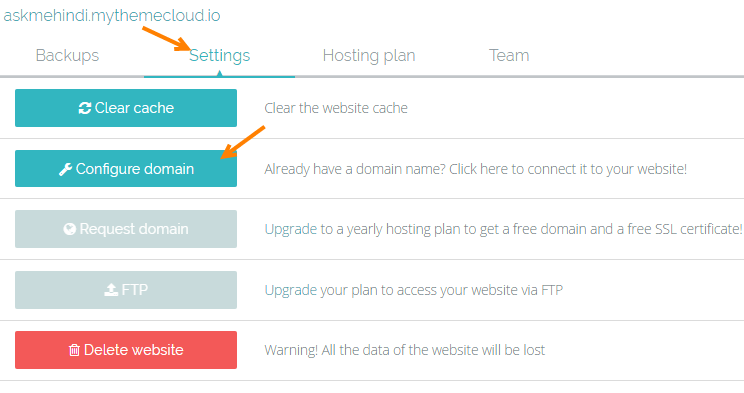 Themecloud par aap site ka sirf single click me backup create kar sakte hain, single click me site ko restore kar sakte hain aur site ka clone (duplicate) other domain me add kar sakte hain. Themecloud website control panel me backups par click kare. Backups me New backup par click karke aap apni site ka new backup create kar sakte hain. Backup ko Restore karne ke liye sirf Restore par click kare aur site ka clone kisi other domain me install karna hai to sirf Duplicate par click kare aur domain add kare. Themecloud hosting ek professional hosting providers hain isliye costly bhi hai. Basic startup plan $9.90/mo. se start hota hai jisme single website install kar sakte hain, 5GB storage and 10,000/monthly visit limit receive hoti hai. Other plans me Business, platinum, freelance plans available hain jo ki kafi costly hai. Beginners ke liye to yah hosting affordable nahi hai but ha agar aapke paas budget hai to Themecloud best option hai easy wordpress site ko manage karne ke liye. ThemeCloud — uske liye sabse best hai jo ek professional website create karna chhate hain without any technical knowledge. Simple control panel par aap site ko manage kar sakte hain, backup and restore karna kafi easy hai. Costly hai isliye beginner ke liye perfect nahi hai but ha agar aap new hosting par apni site move karna chahte hain aur best hosting search kar rahe hain to Themecloud ek option ho sakta hai. Beginners Bluehost and Hostgator jaise low cost shared hosting choose kar sakte hain jo kafi affordable hain. Bluehost par wordpress site kaise banaye? Themecloud 15-days ka trail provide karti hai, isliye aap sabhi ek bar wordpress site create karke jaroor dekhe.